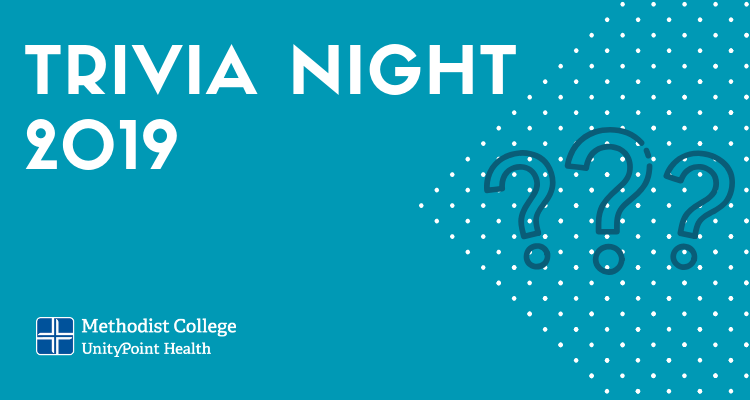 Test your trivia knowledge and help shape the future of healthcare! Proceeds from Trivia Night will benefit the Methodist College Scholarship Fund. Invite your friends and meet us at the Kickapoo Creek Winery. Doors open at 5:30 p.m. Food and drinks available for purchase starting at 6 p.m.
Tickets for the event are $10 per person with registration and payment in advance at the link below. Tickets at the door will be $15 with payment by check or credit card only. Advance registration and ticket purchase will be open until Noon on Thursday, February 28, 2019. 100% of the ticket fee supports the scholarship fund. Kickapoo Creek Winery also is donating a portion of the evening’s food and beverage sales. Teams of 3-8 people per table. You can come solo and be teamed with others or form your own team. 50/50 raffle. Tickets will be $1 per ticket or $5 for 6 tickets.